RENO, NV— The last bolts are being tightened, the dents and gashes from last race’s crashes repaired, and the drivers itching to be back on dirt chasing the SuperLite Championship Series crown at the Surprise, Ariz. Speedworld Off-Road Park for rounds three and four of the Lucas Oil Off-Road Racing Series, April 16 and 17. Yokohama Tires-backed Pat Clark and Kawasaki’s Chad George, who finished second and third respectively in the first round of the series, will pull out all the stops in their plight to conquer the Speedworld Off Road Park podium. 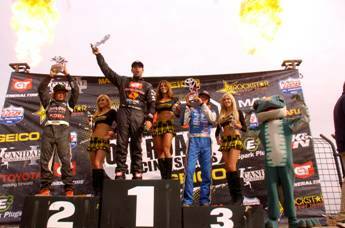 The highly competitive field will put on a horsepower-and-adrenaline-fueled show for the fans, trading paint, mashing fenders and jostling fiercely for position in the crowded and talented 2011 SuperLite racing field. The two Surprise, Ariz. races are the third and fourth contests in a nationally-televised, 16-race series that culminates in the championship in December. SuperLite racing is part of the Lucas Oil Off-Road Racing Series. 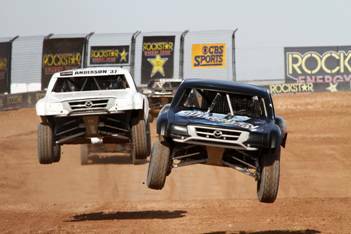 The big air jumps, carnage-producing corners and fender-to-fender action of SuperLite racing has landed it coverage in CBS, SPEED TV, as well as features in publications that include Maxim, Auto Week and Road and Track.